It’s this time of year that I miss home the most. I love it when the air gets crisp, the leaves begin to change, and when pumpkin spiced everything starts to take over every store you walk into. I know- I know pumpkin spice gets old fast, but I can’t help it. Everything feels fresh, exciting, and homely. As much as I love Sheffield, it still doesn’t feel like my home yet. Almost all of my memories took place in Arizona. As boring as Mesa is (it really is), that’s where my life took place, good bad and otherwise, and it’s the place that I know to be home. But life goes on, people move and things change. I suppose with the very physical changes that are going on outside as summer turns to fall, I can’t help but reflect on the changes in my own life and what they mean to me. No matter how radically different my life might be, there are a few constants that I can always count on to ground me. Of course Mike is my number one constant, but that goes without saying. The first is that no matter where I may be I know that my family is always there to support me in whatever way they can. The second – I know that no matter how much time goes by and how much distance is in between us, I know I can always pick up with my friends where we left off (which really says something because I’m terrible about keeping in touch). And finally, being in the kitchen and just doing what I do best always reminds me of my roots. 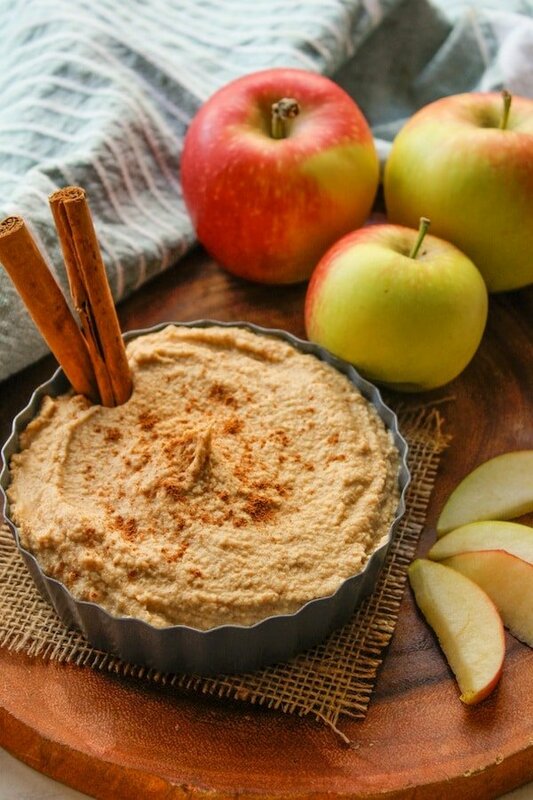 So what does that have to do with this apple spiced hummus? Nothing really. I just thought I’d share. In a blender or food processor put all of your ingredients minus half of the chickpeas and blend until smooth. Add the remaining chickpeas and blend again until smooth. Serve with apple slices, pita chips, or carrot sticks and enjoy. Recipe adapted from Edible Perspective. 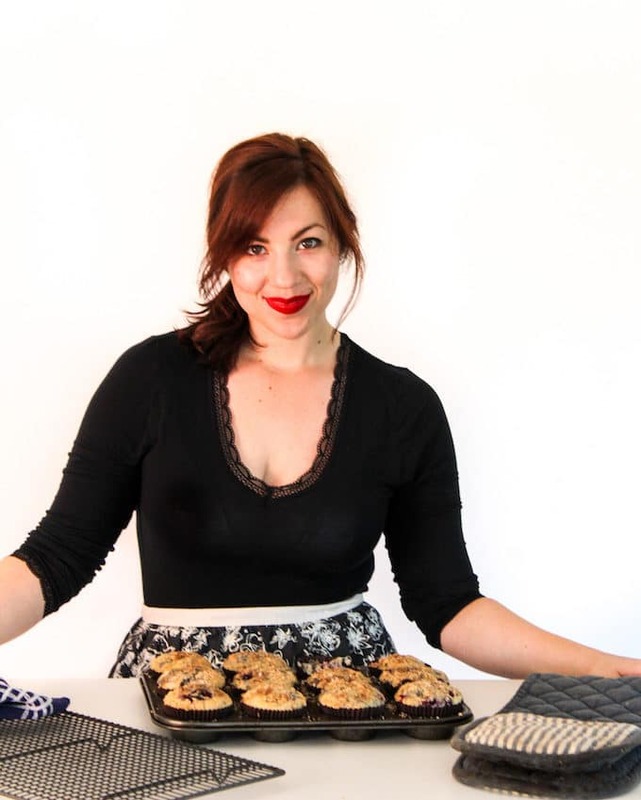 I want to try this again using cashew butter like she did because that sounds fantastic. 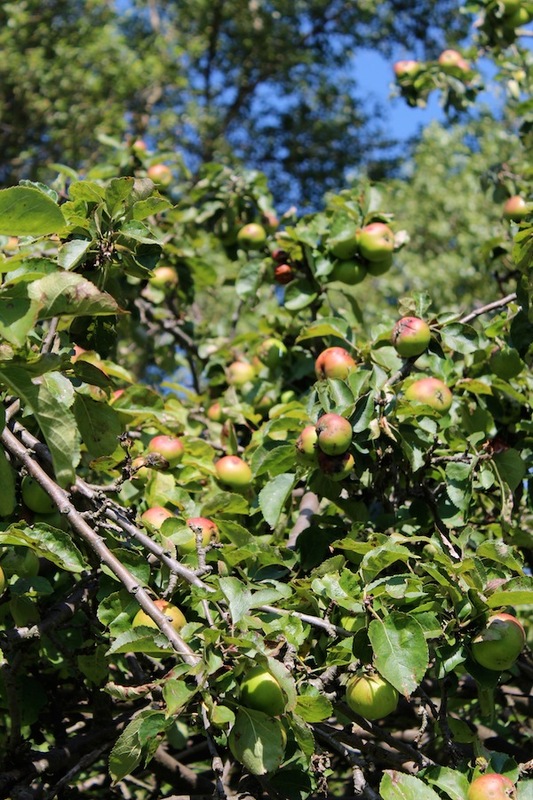 I came home yesterday from an apple harvest festival with many kgs of apples, and therefor looking around for new recipes where I can use some apples. Just made this, and it’s really nice! Thank you! So glad you liked it! Thanks Anki! what a delicious fall snack idea! I love making hummus recipes but never saw this variation, really creative and it looks so yummy too! Aww, thanks, Silvia! I love hummus too! I just tried some Hummus yesterday for the first time. I was real nervous about trying it, but now I’m glad I did! So when I saw your recipe I was super excited! This sounds amazing, hummed and pinning for future reference. Good old fashion hummus is the best! Just sit me down with some pita chips, carrot sticks, and a bowl of hummus an I’m good to go. I hope you like! I love the idea of a sweet tasting hummus! It is so much more fun to get a sweet treat that is nutritious! Thanks for sharing with Saucy Saturdays. Hope to see you next week too! I have never seen a sweet hummus. It sounds delicious. The cashew butter would be yummy too! Thanks, Julie! It’s different, but so worth it! Wow…I totally love hummus….but never even thought to have apples in it. AWESOME…can’t wait to try it. Perfect time of year too!! Yum! I bet this tastes amazing! 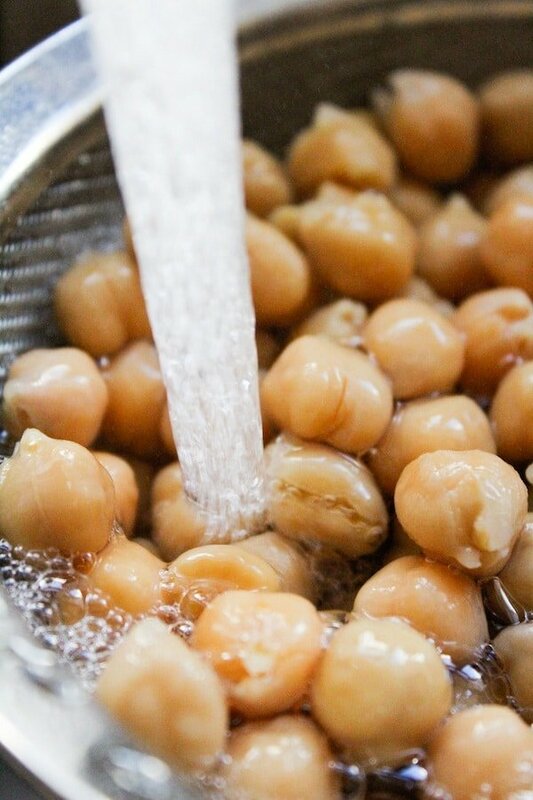 I love how there are so many, different uses for chickpeas! Oh wow! This sounds absolutely amazing! I cannot wait to try it. Thanks for sharing. Pinning. I love hummus but I don’t think I’ve tried that combination. I’m sure it’s delicious because I can almost taste the tart apples and the soft chickpeas mix. Yum! It’s a lot of fun if you’re wanting to try something new! Thanks, Eliz! 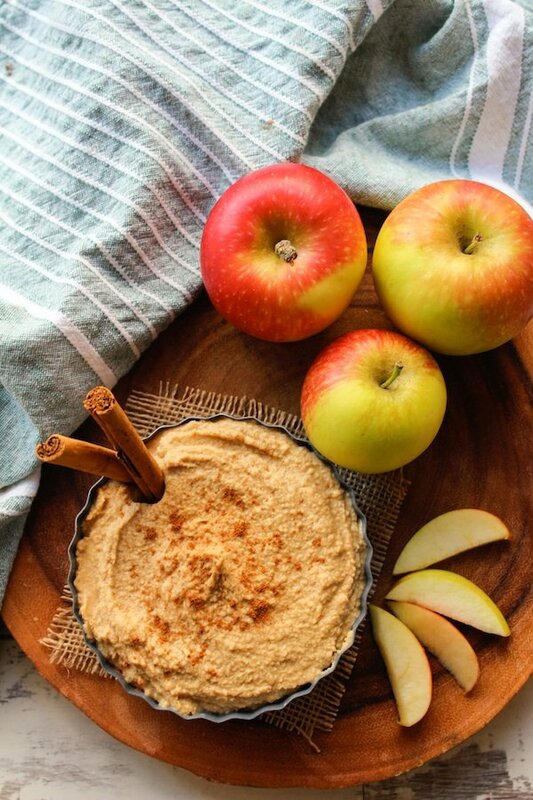 apples, hummus and spicy all the things i like mashed up in one. Right? What’s not to like? This is such a great idea Sarah! And so easy too! I love how you add some peanut butter in it. Growing up, apples with peanut butter was something that my mom would give us, and so definitely a comfort factor there! Can’t wait to try this! Mmm, graham crackers would be a great addition! I am really intrigued by this idea, so much so that I’m going to have to try it. I love the combination of apple and cinnamon but can’t quite get my head around how it will work in hummus. Time will tell! Let me know how it goes! It’s different, but really good! Love the idea of this apply hummus. Your photos are wonderful and make me want to tuck in with gusto. I made my first apple recipe yesterday, though not sure when I’ll be posting it. Thanks, Choclette! I’m looking forward to see what apple recipes you post too!